Posted 21 January 2015 & filed under 18th century, 19th century, Churches, People, Places and spaces, Tudor period. “Richard (Lee) was bred to arms: and it is said that he had been or was, about 1540, captain of the pensioners and he was probably dwelling at Sopwell when in 1543 he was commissioned by the king with Antonio de Berman, and John Thomas Scala ‘expert Italians in the skill of fortifying … On this expedition he accompanied the army into Scotland; and in the plunder of Edinburgh, he brought away from Holyrood House a curious font of brass adorned with figures embossed. He afterward set this font up in the abbey church. It had on it a proud inscription ‘that it had served for the baptizing the King’s children in Scotland’. But this privilege though it raised veneration in the minds of the pious, yet could not save it from the rapine of Cromwell’s soldiers after being used in this church about 100 years”. “At a meeting of the Society of Antiquaries (Scotland) a paper was read on an ancient Scottish lectern now in the Parish Church of Sty Stephen’s, St Albans, Hertfordshire, by Mr William Galloway, architect, Coun. Mem. S.A. Scot. Apart from any conjectures to its history, this lectern is of special interest as being the only know example [either in wood or metal] formerly pertaining to Scotland, which has escaped the disastrous issues of civil and religious commotions. Its history is very singular. About the year 1750 when a grave was being dug in the chancel of St Stephens’s church, the lectern was found buried in the soil. It is supposed to have been thus concealed at some time during the civil wars. It is of cast brass and of a handsome design, consisting of an eagle with expanded wings supported by a shaft decorated with several groups of mouldings, partly circular and partly hexagonal. 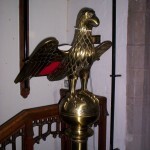 The eagle stands upon a globe, and the shaft has been originally supported on three feet which are now gone. In its present state the lectern is five feet seven inches in total height. It bears the inscription “Georgius Creichtoun, Episcopus Dunkeldensis” (George Creighton Bishop of Dunkeld). He died 24th January 1543, and previous to his elevation to the See of Dunkeld, he had been Abbot of Holyrood. The probability therefore is, that the lectern had been presented to Holyrood by the Abbot on his elevation to the See of Dunkeld, and that it was taken from Holyrood by Sir Richard Lea [ Lee] of Sopwell, who accompanied the Earl of Hertford in his invasion of Scotland in 1543. On his return, Sir Richard presented to the parish church of St Albans a brazen font bearing magnificent inscription to the effect that though previously designed for the baptism only of the children of kings, it now in gratitude for its rescue from the fire which consumed Edinburgh and Leith, performed the same service for the meanest of the English. 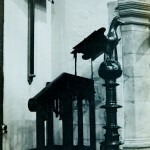 This font which was doubtless abstracted from Holyrood, is no longer known to exist, and there seems no reason to doubt that the lectern, which was saved by being buried during the civil wars, was abstracted at the same time and given to the parish church of St Albans [St Stephens?] by the donor of the font”. Hence we have the streets: Creighton Avenue, Lectern Lane and Holyrood Crescent.